The Rev. 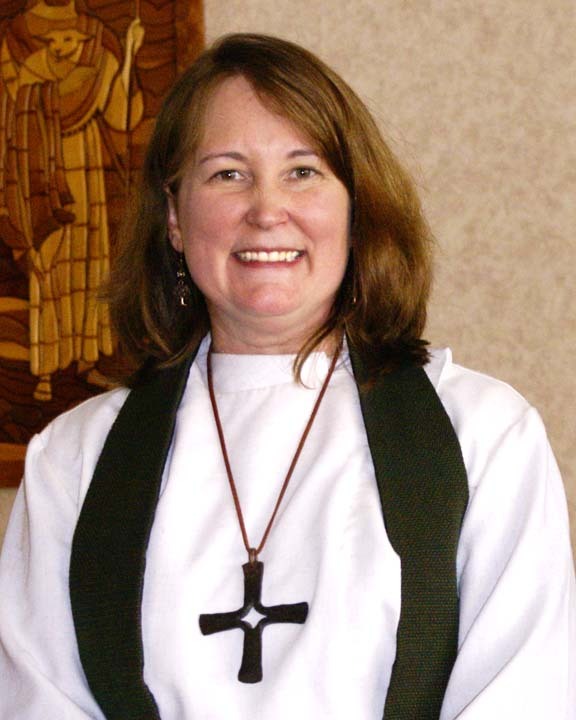 Shelley Wickstrom, WTS, 1986, was elected bishop of the Alaska Synod of the Evangelical Lutheran Church in America Friday, April 27. Shelley currently serves as Co-ordinator of Region 1 of the ELCA. She has served congregations in Alaska and Montana. Shelley, a woman with gentle strength and wisdom, brings years of experience in parish ministry, and service in the broader ELCA. She lived in Alaska before her studies at Wartburg Seminary and served bi-vocationally in her first call in Alaska. She will be a blessing in the church in Alaska and bring a clear voice to the public world as bishop on behalf of the church. The Alaska Synod is 64th out of the 65 synods of the ELCA in membership, but the largest in geographic size. It stretches from the congregation in Shismaref to the congregation in Ketchikan 1400 air miles away. They have the largest and only Inupiat (Alaskan Eskimo) population of the ELCA who make up almost 20% of their baptized membership. The Reverand Agnes Sigurðardóttir, pastor at Bolungarvík and dean of the Westfjord region (far Northwest Iceland), will be the first woman to serve as bishop of the Evangelical Lutheran Church in Iceland. She was elected after the second round of ballots this past week. She will succeed Bishop Karl Sigurbjörnsson, who has served as Bishop of the Lutheran Church in Iceland since 1998. Wartburg Seminary has a number of significant relationships with the Church of IceIand, particularly through Professor Sam Giere who regularly takes students there on J-Terms. He invites holding in prayer sisters and brothers in the Evangelical Lutheran Church in Iceland, Bishop Karl, and Bishop-elect Agnes as they continue to walk forward in faith. More often than not we fail to embrace who God created us to be and instead view ourselves through the lens through which society and culture see us. We search for a love–that only God can give us–in things that are not life-giving and we are left empty. We allow society to strip us of our authenticity until we can no longer recognize the unique individuals God has created us to be. God, however, invites us daily to go within and seek the goodness God has created. Allowing ourselves silence and solitude, we will begin to hear God’s voice speaking to us, telling us that we are beloved children of God. This poem was written in the reflection of God’s love that is calling us from within. The anointing of Jesus is a familiar text. It appears in all four gospels. In the gospel of John, Mary anoints Jesus. She is named. Earlier in the Gospel, Jesus had come to the home of Lazarus when he heard of Lazarus’ death. When he arrived, Martha was the first one to come to Jesus. Jesus told Martha that Lazarus would rise again. Martha misunderstood him and thought he meant Lazarus would rise during the resurrection on the last day. When Mary came to Jesus, she fell to his feet weeping and said to him, “Lord, if you had been here, my brother would not have died.” Mary knew the power of Jesus and her faith moved Jesus deeply. He commanded Lazarus to come out of the tomb. Jesus, Mary, Martha, and Lazarus were friends. It was this deep friendship that brought Jesus back to the house of Lazarus six days before the Passover. This was not the safest place for Jesus to be, but it was where he wanted to be; with his friends. He may have been invited as a way for them to thank him for saving Lazarus, but for Jesus, he was there to say good-bye. The people around the table could not believe what they were seeing. Only slaves washed the feet of guests; and a woman never touched a man, except her husband, and that was only in private; only a woman of loose morals let her hair flow freely; and the cleaning of feet was never done with perfume. What was Mary thinking? If she had anointed his head, it would have been similar to what was done at the installation of a priest, prophet, or king. When people died, that was the time to anoint their whole body. So, what was Mary trying to convey by what she did? Mary had probably heard the rumors that Jesus was going to die for going against the government and stirring up the people. Jesus death would be by crucifixion. Mary knew about crucifixion. She knew that those who die that way were not given a proper burial. She had seen convicted criminals hang until birds and small animals have picked their bones clean. She ached at the thought of her precious Jesus dying that way. She did all she could to show her love, her loyalty and her faith in Jesus. She knelt at his feet and ministered to him. She prepared him for his burial. A few days later, Jesus knelt before the disciples and washed their feet. Was he following Mary’s example? Was Jesus that moved by the way Mary ministered to him that he wanted to do the same for those who had been his loyal followers? Mary had taken a great risk that evening. She had gone against cultural norms. She did it in front of those who would criticize her. But, she was doing what Jesus had done throughout his ministry. She was going against the norm to care for the one she thought needed her care the most. Her actions were in sharp contrast to what was expected of her. Her love for Jesus was all that mattered and she wanted that love to show in her actions. Mary gave everything she had for Jesus. She poured herself out to show her faith. She believed; she was generous, and she was devoted. Jesus became flesh for us and the feet of his body were anointed by Mary. Mary used her hands to honor Jesus’ body and used her hair as a towel. We have been given gifts by God to use to the glory of God. We use those gifts in all we do. We minister to those around us. We all face brokenness and look to each other for support. When one part of the body hurts, we all hurt. Jesus was hung on the cross for our salvation and as resurrection people we continue to be fed the body and blood of Christ each time we come to the table and are nourished for the days ahead. We all were created in God’s image to do God’s work in this world. It is not an easy task. What Mary did that night no one would have imagined. What Jesus did for us in his death and resurrection is more than we could have ever imagined. Or windfalls, grounded, split and broken. Unintentionally stripping personhood and accomplishment without question. It rolls like building waves upon the shore. To be spewed up on alien land, this Nineveh, to proclaim favor, restoration. And my own empty railing. And I am angry enough to die. In conversation of mutual need. The Rev. Sandi Olson Decker, pastor of Lutheran Church of the Good Shepherd, Salinas, California, WTS, 2006, has been chosen for one of Collegeville (Collegeville, MN) Institute’s, week-long writing experiences. Sandi was an avid writer and editor of The Persistent Voice while a student at Wartburg Seminary. How many students have served on the staff of The Persistent Voice over the past 23 years? Over 175! Many, having gained writing and editing experience, have gone on to publish other things. They have come to Wartburg, served, and gone forth to all kinds of service in the church and world. WE INVITE you to contribute your writing. The subject matter can be as broad as the lives, experiences and vision of our readers. News, reviews, poetry, challenges, features and more should in some way relate to the mission statement: addressing issues of gender and justice across the globe and working towards the full partnership of women and men in ministry. Send submissions to ncookeverist@wartburgseminary.edu. We will edit (so don’t worry about your writing form). We will make sure you see the edited version before it is posted under your name.